It was one giant leap for SpaceX on Thursday evening when it successfully completed the first reflight — and landing — of an orbital class rocket. 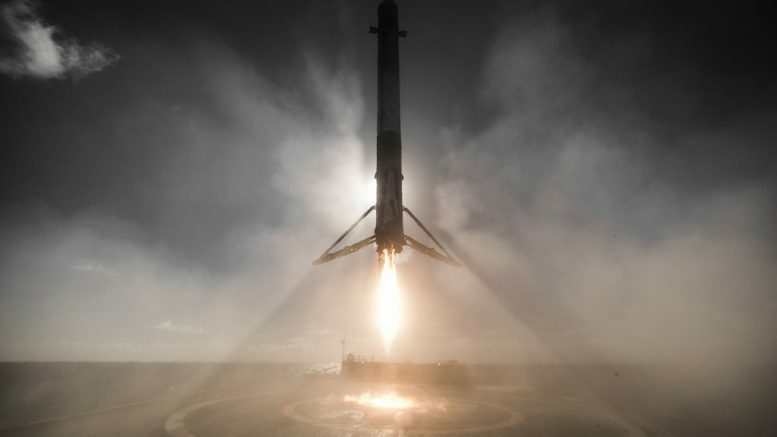 Elon Musk and his team have completed numerous rocket launches and landings over the last 16 months, but bringing a Falcon 9 rocket back home for a second time takes the development of its reusable system to the next level as it continues in its quest to drastically reduce the cost of space travel. It’s a new approach to an old idea. While Jonathan Swift’s fantastical island city of Laputa stayed aloft via magnets, a New York City design firm envisions using an orbiting asteroid to hang a skyscraper above the Earth. Clouds Architecture Office espouses a dream-big-or-go-home philosophy with its plan to construct the world’s “tallest building ever.” The 20-mile high (or long) megastructure would dangle from an asteroid suspended by a cable system tens of thousands of miles long. A number of engineering hurdles stand in the way, so would-be atmospheric settlers of tomorrow will have plenty of time to save up for a down payment. Nevertheless, today’s humble surface-dwellers may see inspirational value in proposing such castles in the sky, regardless of their feasibility. Be the first to comment on "SpaceX Makes History, The Advent of Spacescrapers, and NASA Turns to Origami for Mars Exploration"